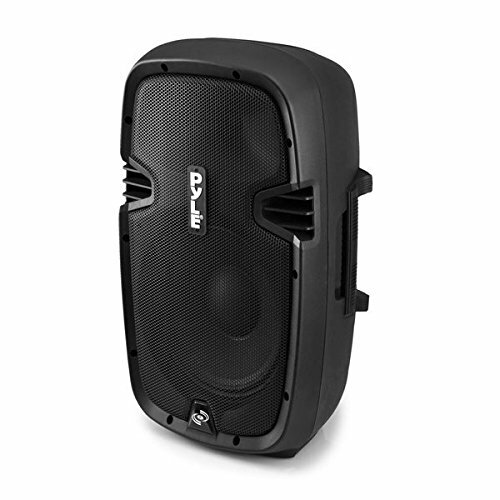 The Pyle Active-Powered PA Speaker brings wide-coverage, two-way loudspeaker sound to any occasion. Used for stage performances and crowd gatherings, this powerful sound system is loaded with plenty of high-powered audio streaming ability and audio configuration controls. Enjoy rugged, durable and reliable sound performance with built-in area projection subwoofer, high-frequency tweeter and audio processing amplifier -- all designed to provide complete audio spectrum coverage. Additional speaker features include the Rear Panel Button Control Center, Digital LCD Display with ID3 Tag Song Readout Info, USB Flash & SD Memory Card Readers, 1/4’’ Microphone Input, Aux (3.5mm) Jack, 35mm Speaker Stand Mount Insert, along with an included wireless remote control. It’s all housed in an engineered, heavy duty ABS cabinet with protective metal grill; providing solid and fortified sound in any environment. Enjoy versatile and high-powered sound projection with the Pyle Loudspeaker PA Sound System.